What should I avoid while giving Cerenia: Topical exposure to Cerenia may cause localized allergic skin reactions in some individuals. Repeated or prolonged exposure may lead to skin sensitization. Wash hands with soap and water after giving the medication. In case of accidental eye exposure, flush the eye with water for 15 minutes and seek medical attention. 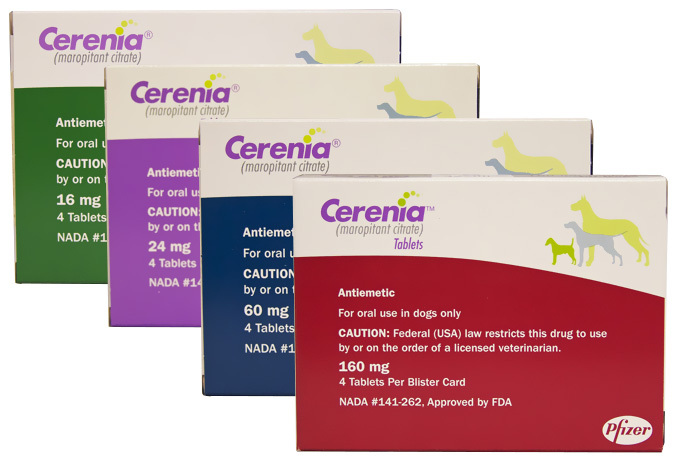 What other drugs will affect Cerenia: Consult your veterinarian before giving Cerenia to pets also being given NSAIDs, heart, anticonvulsant, and behavioral medications since interactions may occur. Drugs other than those listed in this guide may also interact with Cerenia. Talk to your veterinarian or pharmacist before giving any prescription or over the counter medicines, including vitamins, minerals, and herbal products.